Diamond T – 1905 –1966 Charles Arthur (Art) Tilt, the founder of Diamond T, took the name from his fathers shoe company where their better products were marketed as the Diamond brand. The diamond for quality and the T for Tilt. Tilt built his motor car in Chicago in 1905. These were up market and expensive with prices as high at $5,200, although the value of the US dollar was quite low. Picture shows a 1907 Diamond T Touring Car - 40hp, 4cyl water cooled with leather faced clutch, 3 speeds – forward & reverse. I beam front axle, bevel gear drive, double spark ignition, speedometer & clock. In 1910 a local plumbing supply company asked for a truck and this started the venture into trucks, along with the Trademark of a green diamond with a gold border with the big T inside. 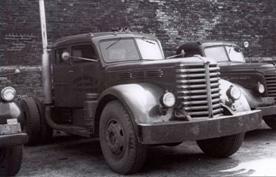 The first ever Diamond T truck built for plumbing goods supplier L. Wolff who were owners of Diamond T cars. This truck was to be known as “Old No 1”, a three tonner and chain driven. From 1911 Charles Tilt specialized in truck building only. The first model had a conventional bonnet with a 4 cyl engine and chain drive with dual solid tyres on the rear, by 1913 worm drive were available. Sales were strictly for the local Chicago market, but with the development of branches and dealers, by 1915 the company was gaining recognition as a national truck manufacturer. 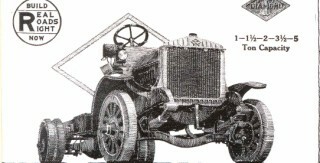 As early as 1914 a wormdrive 1 ½ ton was available with other models from ¾ to 3 ton capacity, the smaller models were J Series, 3 speed, the larger L Series 4 speed 42hp. In 1916 the company bought 13 acres on Chicago’s southwest side and a 250,000 sqft factory boasting a 110,000 ft assembly line was the “Last Word” in truck production was built. At its formal opening in 1917 it was said to be the largest factory in the world devoted exclusively to building motor trucks. The plant had a progressive assembly line, the factory was later expanded to cover 26 acres with nine building and more than 640,000 sqft of floor space. During WW1 civilian production stopped and over the next 18 months, 1,500 heavy duty 3-5 ton class B Liberty trucks were built for the US army, at the Armistice, orders for 2,000 additional Diamond T’s had been placed by the war department as a result of the performance of those in service. Civilian expansion began also and in 1917 the smaller models were LH drive and the larger RH drive. An active marketing campaign was carried out during 1919 and several hundred new dealers were secured. After WW1, the new civilian truck models were built in 2-5 ton sizes with an additional 1 ¾ ton farm special powered by an Hinkley 4 cyl engine with a 3 speed selective sliding transmission to a semifloating worm drive rear axle. Pneumatic tyres were used on the front. In 1921 Diamond T went to LH drive for all its US models. Five models were offered from 1 ½ ton T Series farm special, a 2 ton V Series, 3 ½ ton K Series and a 5 ton FL Series, all with 4 cyl motors standard, with solid tyres or pneumatic optional. In 1923 Diamond T pioneered a new enclosed “coupe” cab featuring 3 point rubber mounting and new design throughout, also steel spider wheels were available on some models and an all new special delivery Model 75 high speed light delivery van of 1 ton capacity on pneumatic tyres was also available. From 1926 Diamond T were completely restyled and re engineered, they had a more powerful 4 cyl Hinkley or Hercules motor, steel spider wheels, pneumatic tyres were now standard and electric lights replace oil lights, also a new redesigned front suspension with a substantial improvement in steering geometry with 10 models from ¾ to 6 ton. The 3 bearing Hercules LA engine developed 32.4HP with full floating rear axle and four speed selective-sliding transmission. There was also a new look in the trucks, with chrome plated radiator grilles and a streamlined appearance, the dealerships increased to 1,000 dealers in the US and Canada alone. The export department built up 80 active distributors in 60 foreign countries in all the principal markets of the world and new sales advertising with four colour inserts. 1928 saw new improved models with chrome hubcaps, new 6 cyl, 7 bearing engines with multi disc clutch, 4 speed gearbox to a spiral-bevel semi floating rear axle with capacities from 1 –12 tons including 6 wheelers with 6 cyl 93.5HP Hercules YXC motor powered the Model 800. Other advances included 4 wheel internal hydraulic brakes with vacuum boosters including the hand brake mounted on the tail shaft. 1929 new models had electric starters standard, now available were new engines of 106hp at 2200 rpm, seven speed gear box, 35mph at 1800 rpm tandem drive 12 ton models with mechanical tipping body. 1930 a 124hp six cyl motor was available with Westinghouse air brakes. In this period synthetic enamels were adopted replacing lacquer paints, also V type windscreens with wind out cranks, a series of special deluxe models were offered with decorative chrome plated hubcaps and dash panels with complete instrumentation including a clock, spring type steering wheels, push button starting, electric cigarette lighter and two tone paint options. 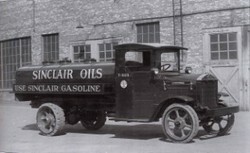 With production records in 1933 Diamond T built the radical streamline low centre of gravity forward control rear engine airport refuelling truck in conjunction with Neil Body Builder for the Texaco Oil Company. The Torpedo Teardrop shape with curved double plate glass windscreen designed for minimum air resistance. The designer used a wind tunnel normally used for aircraft design (what’s new). The tanker was only 79” high (2000mm), the tail section opened to give full access to every point of the engine, the trucks was driven with air operated accelerator, clutch, brakes, gears were also air operated and mounted on the steering column. A microphone was installed in the engine compartment so the driver could hear the gear changes when changing gears, giving the driver a noiseless environment. 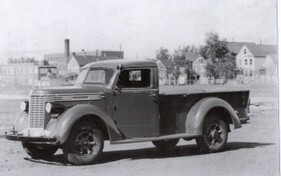 The truck was an outstanding feature of the 1934 World Fair in Chicago with rave reviews. 1934 Diamond T’s are the number 6th truck builder in the US, my other favourite truck, the Mack is 9th. 1935 saw the introduction of the super service engine with an electric furnace alloy block, counter balanced crankshaft, precision bearings and Tocco hardened crankshaft. A new convex V type stainless steel grille was flanked by one piece high crowned full pontoon styled mudguards with tear drop headlights. Two piece tail shafts with roller type centre bearings mounted in a rubber block with needle type universal joints. New models now consisted of 13 models from ¾ ton at 525 US dollars to a 6 ½ ton with double reduction rear axle, the tandem drive walking beam model with 6.1 ratio diffs, 7 speed gear box with over drive .78 with a low reduction 9.5 rear axle brakes 16 ins x 2 ¼ on the drive wheels with a road speed of 42 mph. This year Diamond T offered a 1 ½ ton Hercules diesel with orders from South Africa, Turkey and a number of European countries. Larger models, the D30 – 2 ½ to 4 ton using Hercules 298 cub in developing a max torque of 208lb/ft and maximum out put of 86hp at 2600 rpm, the rear axle ratio of 7.65 and 5.62 in high range with a top speed of 48 mph, a model with a custom sleeper cabin was available. 1937 sees further improvements of cab over engine models from 1 ½ to 4 tons with WB from 96” to 192in. The engine, radiator and gear box are mounted in a sub frame and can be withdrawn from the front for servicing. Its dramatic styling was comparable to the Burlington Zephyr, one of the beautiful streamlined US trains of the day. The new face lift came in 1938 with more chrome strips in the grill, longer one piece mudguards, radiator grille and stainless steel new improved V type windscreen. The Diamond T ½ tonne is used by Moller Taxi Cab Co and many were in service during WW11, however sales drop to 4,393 units compared to 8,118 for 1937, and only the 8th best seller, with Mack 7th having sold 4,406 trucks. This was the start of the mass volume lower cost of trucks built by Ford, GM, International and Chrysler. 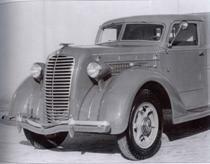 1939 Diamond T take over the sales & service of the Pak-Age-Car, a specialist house to house rear engine delivery vehicle where the driver stands up. The new cab over models, the steering column is adjustable for angle, the hand brakes is pistol grip, engine noise is reduced with rock wool installation. A further face lift came for 1940 with fewer but heavier horizontal V type bars (10) in the grille. This new grille looked similar to the 1938 Cadillac car, this new style was to last until 1951, and its influences were seen in various later models into the mid 1960’s. The largest model was a 10 ton 6 wheel diesel. WW11 truck production included 31,245 6x6 4 ton prime movers, 12,424 half truck scout cars and 6,554 diesel powered 12 ton 6x4 tank transporters developed for the British Army where the heavy prime movers used Hercules engines, transmissions were 5 speed and 2 speed transfer box, by 1942 civilian production had stopped. Several awards for meeting tight schedules and quality advertising was improved with Kodachrome colour photographs by wars end. Civilian production restarted in 1944 with 2887 units and followed the war with improvements made to the pre war designs. The heavy tank hauler pulled a 12 wheeled trailer weighing 12 ¼ tons with loads up to 100 ton, powered by a Hercules 6 cylinder DFXE diesel of 178 nel hp, at 1600 rpm, the gear box was 4 speed with 3 speed low box. At the end of WW11 in 1945, two of the best known Diamond T trucks were purchased by a 30 year old Alice Springs man, Kurt Johannsen, one for 2500 pounds and one with a low loader. Operators in Australia used these heavy tank transporters for heavy haulage and road train operation. Today, one of these trucks (named Bertha) can be seen in the Transport Hall of Fame at Alice Springs. These two Diamond T’s changed the pastoral industry in the north by making it possible with self tracking trailers built by Kurt Johannsen at Alice Springs. Kurt used experiences gained with the government Road Train first operated in Australian in 1934. Other operators were quick to follow with similar trailer combinations. Often pulling five or six trailers with some early photo showing 8 trailers behind a body (tray) truck, opening up the nations more remote regions, which today have become a unique part of Australian history and the envy of transport operators of the world. President Tilt retired in 1946 after leading Diamond T for 41 years, the new president was E.J. Bush. It is recorded that President Tilt was personally responsible for all early Diamond T designs, he continued as Board Chairman until his death in 1956. Civilian production resumed after WW11 with the 1940 styled pre-war range with fourteen models from 8,000 and 50,000 lbs, 3.6 to 25 tonnes Westinghouse air brakes are optional on larger models. Larger model 806H and 900 have 4 speed main and 3 speed joey giving 15 forward and 3 reverse gears, larger models have Continental 190hp diesel model R6572. Total sales of trucks for 1946 are 8093 units, Mack sales are 4687. 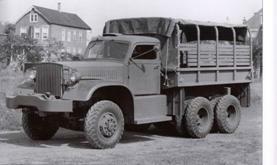 Like all truck manufacturers Diamond T reached production peaks in 1947 with 10,475 trucks and a record 10,651 in 1948. At this time the Diamond T factory floor area covered 14 acres with nine main buildings. The new model 910 was to continue, Diamond T claim as the nations freight car and the handsomest truck in America with passenger car characteristics with super deluxe sleeper with full rounded corners, heavy felt insulated, drip moulding above doors and windows, high grade leather is used on seats and mattresses. Interior side lined with textile quality leather to match seats. The sleeper was 72” (1830mm) wide luxury not seen by other truck manufacturers for maybe 20 years and not till the 1970’s in Australia. The looks and comfort end abruptly with the nickel alloy steel to provide a combination of toughness, wear resistance, fatigue insulated rubber springs and cab mounting. Cummins 150hp diesel or a continental 190hp petrol engine WB from 188 to 236 ins GVW to 50,000lbs, single or tandem axles with large choice of transmission options. 1949 Options available include blinker turning lights, cab lights, extra mirror, twin stop lights. The giant hub cap are also optional. The new model 910N is claimed to be ‘King of the Heavies’ powered by a 200hp Cummins N H B diesel with gross weight of 76000lbs 38 US tons low weight with thermostatically controlled radiator shutters, external air cleaner, stainless steel flexible exhaust tube, quick removable mudguards for engine service. Options include 2 speed axle with air shift, auxillary transmission with under or overdrive and tandem axles. 1950 – The new all steel comfort cab models were introduced and continued Diamond T claim as “America’s Handsomest” motor trucks set completely new standards of motor truck design with all new die formed safety cabins with greater visibility and 9” (230mm) wider than the previous models.